서울시의 중·고등학교 수는 2006년 현재 각각 367개, 295개로, 1970년대부터 꾸준히 증가하다가 2000년 이후에는 증가폭이 둔화되었다. 서울시의 중·고등학교 학생 수는 1990년 대 초까지 지속적으로 증가하다 감소하기 시작하여 2006년 현재 중학교 학생 수는 384,977명, 고등학교 학생 수는 349,154명이다. 중·고등학교 학급당 학생 수는 1970년대 말까지 증가하다 이후로 계속 감소하여 중학교는 2003년, 고등학교는 2001년에 가장 낮았으나 중학교 학급당 학생 수는 최근에 약간의 증가 추세를 보여 2006년 현재 35.3명이며, 고등학교 학급당 학생 수는 증가추세를 보이다 최근 들어 점차 감소하여 2006년 42.3명이다. 중학교의 학급당 학생 수는 은평구, 양천구, 서초구, 강남구가 36명이상으로 높으며, 다른 구들은 거의 유사하다. 고등학교 학급당 학생 수는 양천구가 36명 이상으로 높은 반면에 도심의 중구, 종로구는 32명으로 상대적으로 낮다. 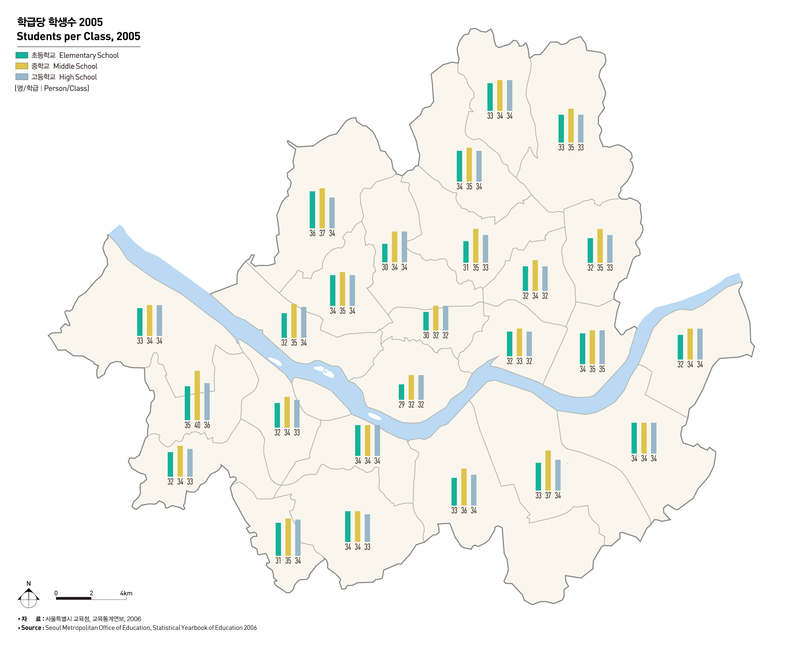 There are 367 middle schools and 295 high schools in Seoul as of 2006. Middle and high schools have steadily increased since 1970s, and the growth trend has slowed down since 2000. The number of middle and high school students went up until early 1990s, and has dropped thereafter, reaching 384,977 and 349,154 respectively, in 2006. The number of middle and high school students per class rose until late 1970s, but declined thereafter, reaching the lowest level in 2003 and 2001, respectively. Middle school students per class slightly increased in recent years, amounting to 35.3 as of 2006. The number of high school students was on the rise, but began to go down recently, and reached 42.3 in 2006. Eunpyeong-gu, Yangcheon-gu, Seocho-gu and Gangnam-gu have more than 36 middle school students per class, higher than other regions where there is no much difference in the number of students. While Yangcheon-gu has more than 36 high school students per class, Jung-gu and Jongno-gu have only 32 students in a class.